Pictured is the East William Street metered parking lot in downtown Delaware. One change the city is considering under its downtown parking implementation matrix is extending the hours the metered spaces are enforced. Currently, the city enforces its parking meters from 9 a.m. to 5 p.m. on weekdays. The city is considering the pros and cons of increasing the enforcement time from 8 a.m. to 8 p.m. While attracting patrons to a bustling downtown seems to be an easy task these days for City of Delaware officials, making sure people find a place to park once they arrive keeps some — like Vice Mayor Kent Shafer — up at night. To address the parking concerns, the city has rolled out an implementation matrix based on various recommendations highlighted in the Downtown Delaware Parking Study released in February by MKSK, a Columbus-based urban planning firm. Assigned to tackle the parking concerns are three subcommittees (enforcement, signage, and pedestrian experience) composed of city staff and community members who have joined forces to look into the feasibility of a number of recommendations listed in the implementation plan as possible short-, mid-, and long-term solutions. “Our goal is to keep the community involved,” Shafer said. “We have a plan, and we are working on the plan. Over the next year, Shafer said, the subcommittees will work closely with downtown businesses and the general public to review the initial list of recommendations, some of which could be instituted in the coming months. “When you go talk to people, everyone says we need to build a parking garage,” Shafer said. “Well, a parking garage is a nice thing to have, but most people don’t know how much they cost. It’s like $15,000 to $20,000 per parking space to build a garage. “We know that is something we might want to do down the road, but there are a lot of things we can do before we consider that type of expenditure,” he added. The first wave of possible solutions being considered, Shafer said, focus on using the existing downtown parking spaces “more efficiently” and include extending parking meter enforcement hours (8 a.m. to 8 p.m.); implementing demand-based meter pricing (higher fees for prime spaces to encourage turnover); reassigning 10-hour parking meters to three hours or less within the core downtown area; increasing meter rates and parking fines; encouraging other modes of transportation into downtown (DATA, walking, and cycling); educating the public about places to park; improving parking-related signage; and investigating the costs of smart meters and kiosks. He added while the city has installed new blue parking signs to help highlight parking areas, many signs throughout the downtown remain “confusing,” which is why the city is looking once again at improving signage. Pointing downtown visitors in the right direction is one thing, but having parking spaces available is another issue. 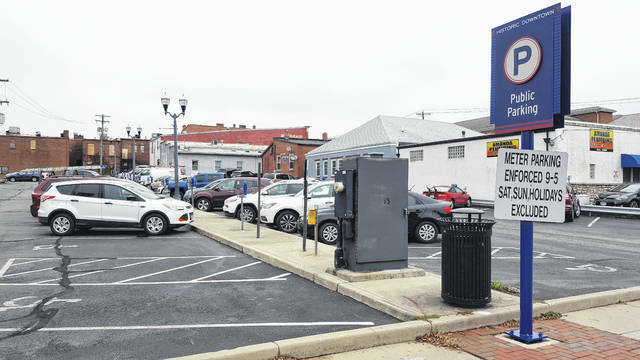 Shafer said in speaking to downtown merchants and patrons, the parking subcommittees realized the city’s use of 10-hour parking meters in the three main metered surface lots (North Franklin Street, East Winter Street, and East William Street) could be causing some unattended issues. In addition to the short-term solutions being tossed around, the city’s plan to address the downtown parking situation also makes note of mid-term and long-term solutions that could be explored. Mid-term solutions — to be considered within the next two to three years — include relocating employee parking to the periphery of downtown; instituting valet parking; formalizing agreements between the city and private property owners of lots used by the public; developing a downtown circulating route with DATA; and installing parking kiosks or smart meters. Shafer said while there is hope the short-term and mid-term solutions will help with downtown parking, he understands there could still be a need for additional parking spots that might require the city to purchase property or look into the feasibility of constructing a parking garage.